The Pantheon was originally built in 27-25 BC by the magistrate Marcus Agrippa (his name appears on the inscription outside), to commemorate the victory of Actium over Antony and Cleopatra. This original temple burned down in 80 AD. The Pantheon was maintained and restored by the emperors Septimus Severus (193-211) and Caracalla (211-17). During its two centuries as a functioning temple, statues of gods filled the niches. Animals were sacrificed and burned in the center; the smoke escaped through the only means of light, the oculus. After Christianity replaced paganism in Rome, the Pantheon was abandoned for a time. Public pagan worship was prohibited in 346 and most pagan temples were closed in 356. Fortunately, a decree of 408 ordered that temples were to be put to new use; thus some have been preserved and were used as secular buildings. The Pantheon remained unused until the Byzantine emperor Phocas (602-10) gave it to Pope Boniface IV (608-15). 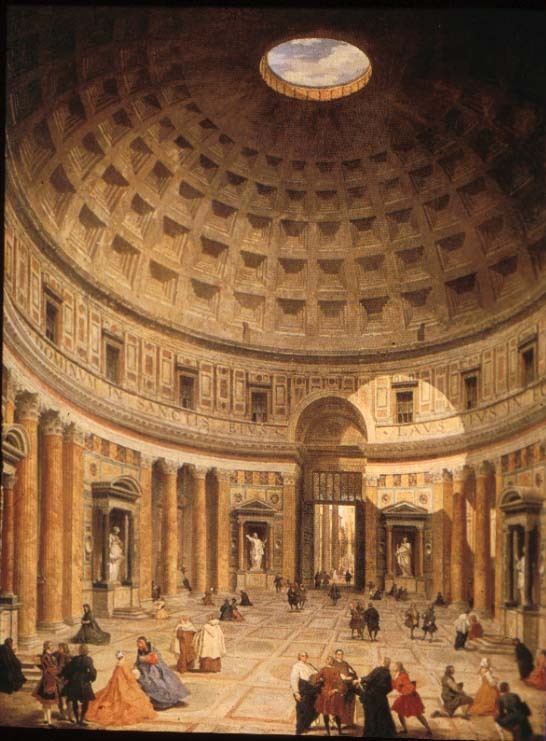 In 609 AD, the Pantheon was consecrated as a Christian church. It was the first pagan temple in Rome to be Christianized, although the practice had been common in the East since the 4th century. The church was dedicated to the Virgin Mary and all the martyrs, thus continuing the tradition of a "catch-all" place of worship.